But wait – isn’t Nancy Gertner a supporter of Democratic gubernatorial hopeful Jay Gonzalez? It sure appears that way from this item in Lauren Dezenski’s Politico Massachusetts Playbook last fall. FIRST IN PLAYBOOK — Former US Federal Judge Nancy Gertner hosted a fundraiser for Dem gubernatorial candidate Jay Gonzalez at her Brookline home last night, the Gonzalez campaign tells me. Globe readers might have wanted to know that in considering Gertner’s takedown of Charlie Baker, don’t you think? Well, Globe readers still don’t know that, even as the Judge Feeley rumpus hits 11. Memo to Globe editorial page editor Ellen Clegg: Time to fess up, yeah? Then again, the Globe isn’t alone in giving Gertner a free pass. CommonWealth Magazine’s Michael Jonas also failed to note her conflict of interest (“[Baker’s] remarks appear to have been the last straw for former federal judge Nancy Gertner, who pens an op-ed in today’s Globe ripping Baker’s comments as a “Trump lite” echo of the president’s habit of “trashing judges with whom he disagrees.”), and MassLive’s Gintautas Dumcius also links to Gertner’s op-ed with no disclaimer. In the end, it’s absolutely Gertner’s responsibility to disclose her vested interest in attacking Charlie Baker. But news outlets should be exercising due diligence as well. Today’s Boston Globe features this op-ed from retired federal judge and Harvard Law professor Nancy Gertner. First one in Gertner’s dock: Charlie Baker. Governor Charlie Baker called Judge Feeley’s sentence “ridiculous and outrageous.” Worse, in a moment that can only be called “Trump lite” in its resemblance to Trump’s habit of trashing judges with whom he disagrees, Baker suggested that the courts deal with Judge Feeley just as it had with the judge who was suspended for inappropriate sexual conduct in his chambers. City Hall a Koh-Conspirator in HuffPost Ortiz Hit? A smashmouth piece in the Huffington Post this week about U.S. Attorney Carmen Ortiz and her pattern of political prosecutions has drawn attention in both local dailies, but, as usual, from different angles. POLITICAL CORRUPTION cases generate big headlines — and big push back. Just ask US Attorney Carmen Ortiz. She made a big splash when she indicted two aides to Boston Mayor Marty Walsh on charges they forced organizers of a music festival to hire union workers. But now, with Walsh presumed to be her ultimate prize, a posse of critics is throwing cold water on the prosecution. Vennochi proceeded to cite criticism of Ortiz by former AG Martha Coakley, attorney Harvey Silverglate, and retired federal judge Nancy Gertner – all of whom were quoted in the HuffPost takedown. Crosstown at the Boston Herald, though, the focus was more on the question of Marty Walsh’s possible involvement in the Ortiz hit, given that she has already indicted two Walsh administration officials on charges of extortion. Today there’s no follow-up in the Globe, but the Herald has this piece by Dan Atkinson. A Herald front-page story yesterday quoted Walsh saying he and his aides had no involvement in the article, titled “This Federal Prosecutor Is Building A Career Indicting The Good Guys.” But the mayor admitted that he and his chief of staff, Daniel A. Koh — who used to work at The Huffington Post — knew the piece was in the works. “Both the timeline and the mayor’s answer raised red flags for us,” said Amelia Chasse, a spokeswoman for America Rising PAC, which filed a public records request with the city for any emails and texts between the Walsh administration and The Huffington Post. Just what Walsh needs right now, eh? One more group emauling him. 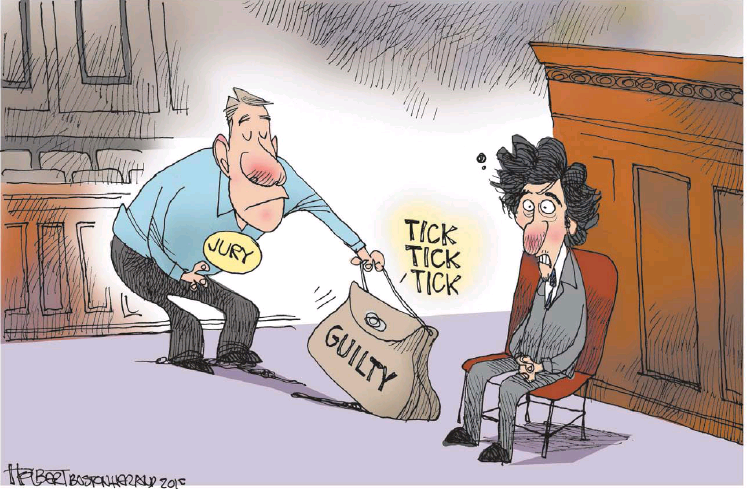 As we await the start of the sentencing phase of the Boston Marathon Bomber trial, the local dailies are – not surprisingly – seeing justice in very different outcomes for Dzhokhar Tsarnaev. The Boston Herald goes for the trifecta in today’s edition: editorial, op-ed column, editorial cartoon – all reaching the same conclusion. Thirty counts. Thirty guilty verdicts. But that is only the beginning. The toughest part is yet to come — the issue of life or death for Dzhokhar Tsarnaev. May this jury show him as little mercy as he showed the victims whose lives he so callously took. In a strange way the death penalty seems too good, too easy for Tsarnaev who also wrote that he envied his brother Tamerlan’s martyrdom. Death won’t dissipate the anger that lingers. It won’t bring back those taken from us. 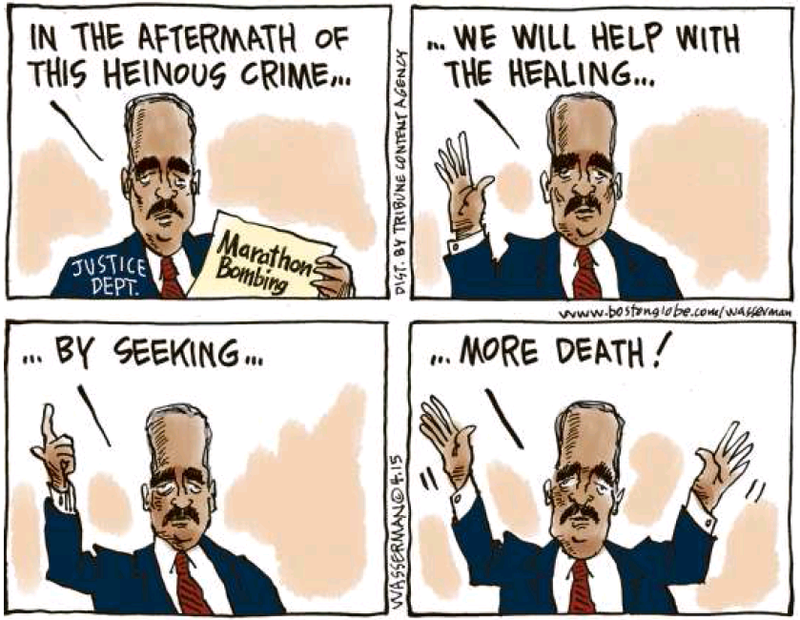 And it will surely take years to actually be carried out — such is the American way of justice. But it is the only just end for this unrepentant terrorist. Crosstown, the Boston Globe does the Herald one better: editorial, two op-ed pieces, editorial cartoon – all pleading the opposite case. As the trial now moves into its sentencing phase — the jury must unanimously vote to execute Tsarnaev, or else he will receive a life sentence — the defense team may also raise legal mitigating factors. Tsarnaev was 19 at the time of the bombing; he was apparently a heavy drug user; he had no prior criminal record. By themselves, none of these would seem like a particularly good reason to spare him, but taken as a whole, and alongside evidence of his brother’s dominant role, they should plant seeds of doubt. In sorting through such life-and-death considerations, jurors face an unenviable task — and mixed precedent. The Oklahoma City bomber, Timothy McVeigh, was put to death. The Unabomber, Ted Kaczynski, wasn’t. Tsarnaev obviously should spend the rest of his life in prison. His defense has already made a good case that he does not meet the exceptionally high standards for a federal execution. The feds overstepped in asserting their superior claim to jurisdiction in this case in anticipation of this very moment, and Massachusetts citizens should pay close attention as prosecutors make their case for execution. When our state outlawed the death penalty in 1984, did we really intend for that prohibition to be conditional? Tsarnaev’s crimes indeed are particularly heinous, but we cannot let emotions cloud judgment. 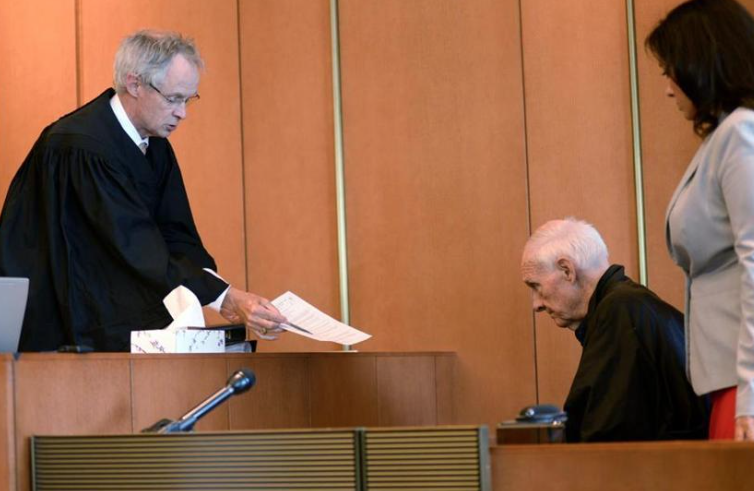 Regardless of the jury’s sentencing decision, this trial has starkly illustrated a decline in Massachusetts’ state sovereignty in deciding — literally — life-or-death matters. It doesn’t get much more opposite than that. Over at the Boston Herald, the message is mixed. In favor of the death penalty [is] columnist Adriana Cohen . . . Columnist Joe Fitzgerald is against capital punishment for Tsarnaev. Former mayor Ray Flynn offers a maybe, writing that he’s against the death penalty but would respect the wishes of the victims’ families.